Staphylococcus aureus has been an important human pathogen throughout history and is currently a leading cause of bacterial infections worldwide. S. aureus has the unique ability to cause a continuum of diseases, ranging from minor skin infections to fatal necrotizing pneumonia. Moreover, the emergence of highly virulent, drug-resistant strains such as methicillin-resistant S. aureus in both healthcare and community settings is a major therapeutic concern. Neutrophils are the most prominent cellular component of the innate immune system and provide an essential primary defense against bacterial pathogens such as S. aureus. Neutrophils are rapidly recruited to sites of infection where they bind and ingest invading S. aureus, and this process triggers potent oxidative and non-oxidative antimicrobial killing mechanisms that serve to limit pathogen survival and dissemination. S. aureus has evolved numerous mechanisms to evade host defense strategies employed by neutrophils, including the ability to modulate normal neutrophil turnover, a process critical to the resolution of acute inflammation. Here we provide an overview of the role of neutrophils in host defense against bacterial pathogens and discuss strategies employed by S. aureus to circumvent neutrophil function. 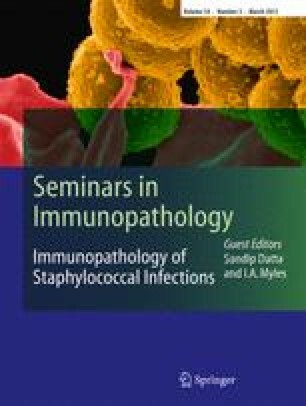 This article is published as part of the Special Issue on Immunopathology of Saphylococcal Infections [34:3]. Staphylococcus aureus has been a serious threat to human health throughout history and was one of the first bacterial pathogens to be identified. It was the ability of S. aureus to cause disease that led to its first description in human pus over 130 years ago by Sir Alexander Ogston [1, 2]. Since then, S. aureus has proven itself well adapted for interaction with humans and is currently a leading cause of human bacterial disease worldwide . For example, S. aureus has been reported as the leading cause of bacterial infections involving bloodstream, lower respiratory tract, and skin and soft tissue in many industrialized countries including the United States, Canada, Europe, Latin America, and the Western Pacific . S. aureus is also the most abundant cause of hospital-associated infections in the United States [4, 5, 6]. Correspondingly, this large number of infections creates a significant financial burden, making detrimental impacts on public health systems around the world . With approximately half a million people acquiring staphylococcal infections in the USA per year, the cost of S. aureus healthcare-associated infections was estimated to exceed 14 billion dollars in 2003 [7, 8]. Interestingly, this versatile pathogen is considered a human commensal microbe, as it asymptomatically colonizes the anterior nares of ∼30% of non-institutionalized individuals . Yet given the opportunity, S. aureus has the unique ability to cause a wide range of infections and syndromes, including skin and soft tissue infections, food borne illness, toxic shock syndrome, bacteremia, sepsis, endocarditis, osteomyelitis, necrotizing fasciitis, and pneumonia. An armament of well-studied virulence factors, ranging from secreted toxins to immune evasion molecules, lends S. aureus effective at causing disease . In addition, the rise in occurrence and severity of infections over the last 70 years has been attributed to the evolution of highly virulent, drug-resistant strains that now challenge our ability to treat such infections. Further, there has been a recent increase in the burden of antibiotic-resistant S. aureus within the community setting [11, 12]. These community-associated methicillin-resistant S. aureus (CA-MRSA) strains have an enhanced virulence potential, in that they are able to cause a wide range of disease in otherwise healthy individuals, drastically changing previous clinical epidemiology of methicillin-resistant S. aureus (MRSA) . The enhanced virulence potential is related in part to the ability of these strains to circumvent killing by human polymorphonuclear leukocytes (PMNs or neutrophils), the most prominent cellular host defense against invading microorganisms. This article will provide a brief history of the rise of highly-virulent, drug-resistant S. aureus strains, an overview of the role of neutrophils in host defense, and review immune evasion strategies employed by S. aureus to circumvent neutrophil function, including strategies yielding the enhanced virulence of CA-MRSA strains. S. aureus is notoriously adept at acquiring resistance to antibiotics, owing to much of the pathogen’s recent success [11, 14]. Inasmuch as the development and widespread clinical use of penicillin in the early 1940s marked the beginning of the “antibiotic era,” reports of S. aureus strains harboring resistance to penicillin by 1942 marked the beginning of our critical, ongoing battle against antibiotic resistance . Thereafter, the prevalence of penicillin-resistant S. aureus (PRSA) increased dramatically in nosocomial settings, with the increase being attributed completely to the use of penicillin [16, 17, 18]. Increases in the number of PRSA infections lead to the inefficacy of penicillin treatment within 10 years of the miracle drug’s introduction, necessitating the development of alternative treatments [17, 19]. Likewise, the introduction of methicillin—a β-lactam antibiotic developed for treatment of PRSA infections—in 1959 quickly led to the onset of a second “epidemic wave” of antibiotic resistance, as infections caused by methicillin-resistant strains were reported 2 years later in 1961 [17, 20, 21]. Thereafter, MRSA became endemic to hospitals and health care facilities worldwide, leading to the global MRSA pandemic in health care settings that continues today [3, 17, 22]. A high percentage of hospital-associated S. aureus infections in the USA are caused by MRSA [7, 23, 24]. Notably, invasive MRSA infections are considered a major cause of human mortality in the USA—there were approximately 19,000 deaths in the USA in 2005 and the mortality rate for invasive MRSA infections was reported as 20% . In the USA, MRSA is likely the leading cause of death by any single infectious agent, with fatalities from MRSA infection estimated to surpass those caused by HIV/AIDS [5, 25]. Antibiotic use within the nosocomial setting has created high selective pressure for development of antibiotic resistance, and S. aureus has acquired resistance to virtually all antibiotics [14, 26]. Multidrug-resistant MRSA strains, which combine resistance to β-lactam antibiotics with resistance to other classes of antibiotics, are becoming increasingly frequent in the healthcare setting, representing a major concern for treatment of MRSA infections . Taken together, the high occurrence of infections caused by drug-resistant S. aureus is problematic and demonstrates the urgent need for development of novel treatment strategies. The majority of infections caused by MRSA have historically been hospital-associated, occurring in immunocompromised individuals or in patients with pre-disposing risk factors, such as surgery, surgical incisions, the presence of indwelling medical devices, or pre-existing infections [6, 27, 28, 29]. However, MRSA epidemiology changed in the 1990s with reports of infections caused by strains of MRSA occurring outside of the healthcare setting in otherwise healthy individuals, the first reports of bona fide CA-MRSA infections [12, 29]. CA-MRSA also spread rapidly among diverse groups of healthy individuals, demonstrating an enhanced transmissibility and/or ability to colonize, in addition to being highly virulent [11, 18, 30, 31, 32, 33, 34, 35, 36, 37, 38, 39, 40, 41]. CA-MRSA infections have been reported in regions all over the world, including Asia, Australia, Canada, Europe, South America, and the USA, rapidly reaching pandemic proportions [42, 43, 44, 45, 46, 47, 48, 49, 50, 51]. The epidemic spread of CA-MRSA in the USA has led to an overall increase in the burden of MRSA . Concomitant increases in staphylococcal burden have been observed worldwide since the emergence of CA-MRSA [51, 53, 54, 55]. The majority of infections caused by CA-MRSA present as skin and soft tissue infections (∼90%) and most are abscesses or cellulitis with purulent drainage [52, 53, 55, 56, 57]. However, the most prominent CA-MRSA strains also have a proven ability to cause severe invasive diseases such as necrotizing fasciitis and necrotizing pneumonia, rarely seen before the rise of CA-MRSA [17, 29, 58, 59, 60, 61, 62, 63]. Although invasive infections associated with CA-MRSA are relatively infrequent, they accounted for 14% of all invasive MRSA-associated fatalities in the USA in 2005 . Predominant CA-MRSA strains such as pulsed-field gel electrophoresis (PFGE) types USA300 and USA400 are genetically distinct from traditional HA-MRSA strains in part because they contain a unique staphylococcal cassette chromosome (SCC) mec element (SCCmec type IV) [17, 64, 65, 66, 67, 68]. In contrast to larger SCCmec elements that encode resistance to multiple antibiotics, SCCmec type IV provides resistance to solely β-lactam antibiotics with apparently little or no fitness cost to the pathogen, likely contributing to the success of CA-MRSA strains [17, 64, 65, 66, 67, 68]. Other genetic and molecular factors are associated with the unique ability of CA-MRSA strains to disseminate rapidly and cause disease in otherwise healthy individuals. These factors will be discussed in further detail below. The ability of S. aureus to cause disease has fueled much research effort aimed at understanding the intricacies of interaction between S. aureus and host immune cells. This has resulted in the description of multiple, redundant strategies employed by S. aureus to evade and/or combat host immune response mechanisms. Many of these strategies serve to protect/defend the microbe against primary interaction with the innate immune response, which includes interaction with neutrophils. As the major cellular component of the innate immune system, neutrophils serve as the critical, primary defense against invading organisms, providing a rapid, non-specific, and potent response to infectious challenge. Defects in neutrophil function result in serious immune deficiencies and syndromes and are associated with recurrent and often fatal S. aureus disease [69, 70]. Thus, there is no question that neutrophils are critical for defense against S. aureus infections. On the other hand, S. aureus—especially CA-MRSA—have the demonstrated ability to circumvent killing by human neutrophils, and can ultimately cause rapid destruction of these important host cells [71, 72]. This unique ability is linked to the enhanced virulence of these strains and their capacity to cause disease . Understanding the complex interaction between S. aureus and human neutrophils is critical to understanding the ability of S. aureus to cause disease. Neutrophils are classically underappreciated professional phagocytes, with regard to the history and development of modern immunology. The focus of early immunologists was aimed at understanding the life-cycles and functions of lymphocyte sub-types, and their ability to play diverse roles in antigen presentation, direction and regulation of immune response, and cytotoxic capacity, all in the context of the novel concept of adaptive (acquired) immunity. Although non-specific innate immunity was appreciated, the only professional phagocytes of noted significance were mononuclear phagocytes—monocytes and macrophages. Unlike neutrophils, monocytes were known to be long-lived cells with significant metabolic capacity and the ability to produce immune regulatory factors. Moreover, they were well considered for their antigen-presenting capacity as well as the ability to differentiate into tissue macrophages and other fixed tissue cell types. The ability of neutrophils to rapidly migrate to sites of inflammation as well as their capacity to surround and engulf foreign bodies was described in the early twentieth century. However, subsequent studies demonstrating rapid neutrophil turnover in blood, short tissue life spans, small capacity for oxidative phosphorylation, utilization of primarily anaerobic metabolism, and little known capacity to synthesize new proteins, engendered neutrophils largely as end-stage cells with limited metabolic capacity [73, 74, 75, 76]. However, research performed in the late 1960s marked the first of a large body of evidence that turned the tide for the underappreciated neutrophil. This work ultimately evolved into our modern understanding of innate immunity, which now encompasses the critical, diverse roles of neutrophils as potent executioners in host defense, and serve as an important interface between innate and adaptive immune responses. These early studies demonstrated for the first time that human neutrophils produce potent reactive oxygen species and contain antimicrobial proteins and enzymes in cytosolic organelles known as azurophilic granules [77, 78, 79, 80]. Biochemical studies that continued through the late 1980s and early 1990s characterized in detail, additional, important capabilities of neutrophils including the assembly and activation of the phagocyte NADPH oxidase, mechanistic functions of granule proteins, the role of actin in the mobilization of phagocytic cells, and the discovery that bacterial-derived N-formyl peptides induce chemotaxis and enhance microbicidal functions of neutrophils [81, 82, 83, 84, 85, 86, 87, 88, 89, 90]. These studies quickly drew additional interest, sparking the use of neutrophils as model host cells for the study of new signal transduction pathways that included calcium transients, phosphorylation events, G protein-coupled receptors, and phospholipid signaling and metabolism [91, 92, 93, 94, 95, 96, 97, 98, 99, 100]. Further validation of the diversity and importance of neutrophil function came with the more recent description of mechanisms underlying normal neutrophil turnover, which we now know occurs by spontaneous or constitutive apoptosis. The final stage of neutrophil differentiation can be considered as the induction of apoptosis, and this process leads to the recognition and phagocytosis of apoptotic neutrophils by macrophages [101, 102, 103, 104]. In addition, apoptosis or a form of programmed cell death similar to apoptosis is typically induced by phagocytosis and subsequent activation of the cell. Timely removal of spent neutrophils serves to prevent inadvertent release of tissue-damaging molecules from dying neutrophils should they undergo lysis, and thereby promotes resolution of inflammatory response. . Contrary to the classic institution, recent studies have clearly demonstrated a relatively high transcriptional capacity for neutrophils, with the potential to synthesize many new proteins in response to various stimuli [106, 107]. This includes the production of multiple cytokines and chemokines, expanding the diverse function of neutrophils as regulators of immune function . In corroboration, the importance of neutrophils was gradually placed in proper perspective with the description of several serious human diseases caused by underlying neutropenia and/or defects in neutrophil function. These conditions are associated with an increased risk of infection from bacteria and fungi . Additionally, medically induced neutropenia, e.g., during cancer chemotherapy or use of cytotoxic drugs, is the most common immunodeficiency associated with significant morbidity, demonstrating in part the relationship between functions served by neutrophils and the outcome of infection [109, 110, 111, 112]. Collectively, the current body of evidence disputes the early, naïve concept of the neutrophil, unequivocally demonstrating the indispensable nature and diverse function of these cells in the defense against many invading microorganisms. Ultimately this has redefined the function and importance of the innate immune system. Neutrophils are short-lived granulocytes derived from pluripotent hematopoietic stem cells in the bone marrow . Although granulocytes and lymphocytes are derived from similar pluripotent stem cells, granulopoiesis is distinct from that of lymphopoiesis, requiring a unique set of transcriptional regulators that facilitate the maturation of granule proteins and surface markers/receptors characteristic of granulocytes [114, 115]. Further distinction of granulocytes includes morphological characteristics, such as the presence of a multi-lobed nucleus. The majority of hematopoiesis is devoted to granulopoiesis, as nearly 60% of leukocytes within the bone marrow are granulocyte precursors [73, 75]. Early in the neutrophil differentiation process, cells develop phagocytic capacity followed by development of oxygen-dependent microbicidal activity, increased adhesiveness, cell motility, chemotactic response, and other cell type-specific traits, proceeding through a well-characterized, carefully regulated, multi-step progression into mature neutrophils [113, 114, 116]. During maturation the number of mitochondria and ribosomes decreases, while glycogen granules, the main source of energy, fill the cytoplasm of mature neutrophils [70, 73]. There are two major populations of granules present in mature neutrophils. Primary or azurophilic granules, which are first to develop during granulopoiesis, contain myeloperoxidase (MPO) and a variety of proteolytic enzymes (cathepsins, proteinase-3, and elastase), antimicrobial defensins, and bactericidal/permeability-increasing protein [73, 117, 118, 119, 120, 121]. These microbicidal granules are considered unique from lysosomes, in that they lack traditional lysosomal membrane markers and traffic as regulated secretory granules [122, 123, 124, 125]. The other major type of granules present are secondary or specific granules, which mature late during differentiation, and contain a number of functionally important membrane proteins including flavocytochrome b 558, lactoferrin, collagenase, as well as receptors for chemotactic peptides, cytokines, opsonins, adhesion proteins, and extracellular matrix proteins [73, 117, 126, 127, 128, 129, 130, 131, 132, 133, 134, 135, 136]. Upon maturation, neutrophils are released into the bloodstream where they circulate for ∼10–24 h before migrating into tissue where they may function for an additional 1–2 days before undergoing apoptosis and being cleared by macrophages [73, 74, 75, 103, 104, 137, 138]. Normal neutrophil turnover in an average adult is on the order of 1011 cells per day . In addition to maintaining steady-state levels of circulating neutrophils, the hematopoietic system has the remarkable ability to drive “emergency” granulopoiesis in response to the increased demand of infection, expanding the pool of neutrophils in circulation when necessary [139, 140]. A dynamic portion of circulating neutrophils roll along the walls of postcapillary venules, via transient interactions with endothelial cells, surveying connective tissue, mucosal membranes, skeletal muscle, and lymphatic organs for signs of tissue damage, inflammation, or invading microorganisms [141, 142, 143] (Fig. 1). This dynamic pool of marginating cells searches for the presence of host- and/or pathogen-derived chemotactic signals or chemoattractants. In response to damage or the presence of invading pathogens, a variety of host cells such as monocytes, macrophages, mast cells, fibroblasts, keratinocytes, endothelial and epithelial cells produce and secrete potent inflammatory mediators and neutrophil chemoattractants. These mediators include interleukin-8 (IL-8, CXCL8), GROα (CXCL1), granulocyte chemotactic protein 2 (GCP2, CXCL6), and leukotriene B4 (LTB4), which bind and engage specific surface receptors on surveying neutrophils. These signals direct neutrophil chemotactic movement out of intravascular circulation to sites of damage or infection within tissues, resulting in a rapid influx and accumulation of neutrophils. S. aureus surface components such as lipoteichoic acid (LTA) or capsular polysaccharide as well as secreted molecules such as toxic shock syndrome toxin (TSST)-1, staphylococcal enterotoxin A, and staphylococcal enterotoxin B have been shown to elicit IL-8 production by monocytes, epithelial cells, and endothelial cells [144, 145, 146, 147]. Additionally, CD4+ T-cells stimulated with S. aureus capsular polysaccharide produce cytokines that recruit neutrophils to sites of infection, demonstrating the range of cell types that play a role in the recruitment of neutrophils [148, 149]. S. aureus surface components, primarily peptidoglycan (PGN), have also been shown to activate the complement cascade, inducing production of the complement cascade component C5a, another potent neutrophil chemotactic molecule . Bacterial-derived products such as N-formyl peptides or the phenol-soluble modulins (PSMs) produced by S. aureus have the demonstrated ability to recruit neutrophils directly [150, 151, 152]. Many neutrophil chemotactic molecules also act as priming agents, serving to enhance neutrophil responses to a second stimulus. Neutrophil priming, first described in the early 1980s, is classically defined as the ability of a primary agonist, typically at sub-stimulatory concentrations, to enhance the production of superoxide in response to a second stimulus . Since then, many studies have expanded on the original definition, going on to demonstrate that the priming process occurs on almost all levels of neutrophil function, including the enhancement of adhesion, phagocytosis, cytokine secretion, leukotriene synthesis, degranulation, and oxidative and non-oxidative microbicidal activities . It is thought that priming prepares neutrophils for maximal response to invading microorganisms, thereby promoting efficient clearance of such invaders. Corroborating evidence to date demonstrates that the more responsive state of the neutrophil is attributable to (a) partial assembly of the NADPH oxidase, (b) reorganization of the plasma membrane and redistribution of signaling molecules into lipid rafts, (c) modulation of intracellular signaling intermediates, (d) mobilization of secretory vesicles and enrichment of specific surface receptors (CD11b/CD18), (e) cytokine secretion, and (f) transcriptional regulation of several gene families . Although priming leads to observable phenotypic differences, it remains distinct from neutrophil activation in that it triggers neither release of azurophilic granules nor production of superoxide [13, 153, 155]. Neutrophil priming is induced by many host-derived factors, including cytokines, chemokines, growth factors, lipid-derived signaling molecules, as well as by physical cell–cell contact and adhesion . Many bacterial-derived factors also induce neutrophil priming . Some bacterial-derived products, such as S. aureus LTA, are agonists for Toll-like receptors (TLRs), which play a critical role in pathogen-mediated neutrophil priming and pathogen recognition (discussed below). Upon recognition of chemotactic signals and/or neutrophil priming, neutrophils exit peripheral circulation by transmigration across the endothelial wall, a process known as extravasation (Fig. 1). The process of extravasation begins by tethering of neutrophils to endothelial cells, transient interactions that facilitate rolling of surveying neutrophils along the endothelial wall. Tethering interactions are mediated by a family of C-type lectin glycoproteins known as selectins, which are upregulated on the surface of cytokine-activated endothelial cells (E- and P-selectin), activated platelets (P-selectin), and primed neutrophils (L-selectin, CD62) [141, 156]. Selectins expressed on the surface of endothelial cells and neutrophils interact with their respective carbohydrate ligands on the opposing cell surface, resulting in initial tethering and subsequent rolling of neutrophils along the endothelial wall . Rolling is arrested by integrin-dependent interactions via leukocyte adhesion molecules such as CD11a/CD18 (LFA-1) and CD11b/CD18 (Mac-1), resulting in firm neutrophil adhesion [158, 159]. Transmigration, facilitated by several neutrophil surface molecules including CD31 (PECAM1), CD54 (ICAM1), CD44, and CD47, may then proceed between or through endothelial cells into tissues [160, 161, 162, 163, 164]. Following extravasation into tissues, polarized neutrophils proceed to the site of infection by chemotaxis. Once at the site of infection, the real work for neutrophils begins, as they bind and ingest invading microorganisms by a process known as phagocytosis, a critical first step in removal of bacteria during infection. Neutrophils recognize numerous surface-bound and freely secreted bacterial products such as PGN, lipoproteins, LTA, lipopolysaccharide, CpG-containing DNA, and flagellin. Such conserved bacterial products are generally known as pathogen-associated molecular patterns (PAMPs) and are recognized directly by pattern recognition receptors (PRRs) expressed on the surface of the neutrophil. Engagement of such receptors activates signal transduction pathways that prolong cell survival, facilitate adhesion and phagocytosis, induce release of cytokines and chemokines, elicit degranulation, and promote reactive oxygen species (ROS) production and release, ultimately contributing to microbicidal activity . The importance of PRRs in host defense is perhaps exemplified by the enhanced susceptibility of TLR2 deficient mice to infection by S. aureus compared with wild-type mice . Although many chemoattractant molecules and TLR ligands have the ability to elicit degranulation and ROS production, neutrophil activation generally requires concentrations of ligand/stimulus higher than that required for priming and chemotaxis. Thus, activation is likely delayed until neutrophils reach sites of infection where concentrations of stimulatory ligands are highest. NOD-like receptors are PRRs located in the cell cytoplasm rather than the plasma membrane or membranes of granules. These proteins serve to detect intracellular microbial components and respond similarly to other PRRs by inducing downstream signaling cascades involved in mediating inflammatory response and neutrophil function . For example, NOD2 senses muramyl dipeptide derived from S. aureus PGN and subsequently promotes transcription of NF-κB target genes in the nucleus . The collectins are a family of secreted, soluble C-type lectins such as mannan-binding lectin (MBL). Collectins are yet another type of PRR and bind and recognize carbohydrate moieties on the surface of invading microorganisms. These molecules enhance recognition by surface receptors on neutrophils (opsonization via the lectin pathway of complement activation), activate other PRRs, facilitate efficient phagocytosis, and elicit release of cytokines and production of ROS [167, 168, 169]. Peptidoglycan recognition protein (PGRP) is a secreted host protein that binds PGN and Gram-positive bacteria [170, 171]. An isoform known as PGRP-short is produced by neutrophils and contributes directly to bactericidal activity rather than directing downstream signaling responses . Although many PRRs such as TLRs enhance binding and recognition of microbes, there is little evidence to date demonstrating that these receptors induce phagocytosis directly, suggesting that PRRs may act as co-receptors . That said, there are exceptions to this idea. For example, dectin-1, a C-type lectin, binds β-glucan residues on fungi and promotes phagocytosis and subsequent neutrophil activation, ultimately killing ingested fungi . Unlike the unique phagocytic uptake induced by dectin-1, phagocytosis of most microorganisms is promoted or at least markedly enhanced by opsonization with serum host factors, such as specific antibody, complement, and/or MBL (generally fungi) . For this purpose, neutrophils express multiple antibody-Fc and serum complement receptors, including CD16 (FcγIIIb, low affinity IgG receptor) [176, 177], CD23 (FcεRI, IgE receptor) , CD32 (FcγRIIa, low affinity IgG receptor) , CD64 (FcγRI, IgG receptor) , CD89 (FcαR, IgA receptor) , CIqR , CD35 (CR1) [182, 183], CD11b/CD18 (CR3) [184, 185], and CD11c/CD18 (CR4) . Activation of complement facilitates the deposition of complement components C3b, iC3b, and Clq on the surface of invading microorganisms , and serum complement is fixed readily on the surface of antibody-coated microbes. Taken together, the combined action of PRRs, and complement and antibody receptors maximizes recognition and phagocytosis of invading microorganisms (Fig. 1). The process of phagocytosis itself occurs independent of clathrin, relying on regulation of actin polymerization early in uptake and during formation of the nascent phagosome . The phagosome serves to restrict nutrient sources and provides the neutrophil an isolated compartment that may be made replete with an array of toxic, microbicidal agents. Phagosomal maturation is a stepwise process involving fusion of neutrophil secretory vesicles and granules with the phagosome, which serves to modify phagosomal membrane composition, and contents and environment of the lumen . This process also enriches the phagosome with transmembrane components of the NADPH oxidase, which in turn serve as the nidus for assembly of the enzyme complex. Neutrophils have remarkable phagocytic capacity, and for example, are able to ingest more than nine yeast particles measuring 2 × 3 μm, themselves having a diameter of only ∼10 μm . The process of neutrophil phagocytosis triggers synthesis of a number of immunomodulatory factors [102, 189, 190, 191]. Production of these factors by neutrophils recruits additional neutrophils, modulates subsequent neutrophil responses, and coordinates early responses of other cells types such as monocytes, macrophages, dendritic cells, and lymphocytes, thereby providing an important link between innate and acquired immune responses. Additionally, phagocytosis has been shown to accelerate programmed cell death (apoptosis) of neutrophils, a process known as phagocytosis-induced cell death (PICD) . The phenomenon of PICD is now considered a final stage of neutrophil differentiation for activated cells and appears critical to the resolution of the inflammatory response [101, 154]. This phenomenon will be discussed further below. Neutrophils employ numerous oxygen-dependent and oxygen-independent strategies to concertedly destroy invading microbes. Phagocytosis is accompanied by the generation of microbicidal ROS (oxygen-dependent) and fusion of cytoplasmic granules with microbe-containing phagosomes (degranulation). Degranulation enriches the phagosome lumen with antimicrobial peptides and proteases (oxygen-independent process), which in combination with ROS create an environment non-conducive to survival of the ingested microbe(s) (Fig. 1). In the most classical sense, neutrophil activation is intimately linked with the production of superoxide and other secondarily derived ROS, an oxygen-dependent process known as the oxidative or respiratory burst . High levels of superoxide are generated upon full assembly of the multi-subunit NADPH-dependent oxidase in both the plasma- and phagosomal membranes. The active enzyme complex is comprised of an integral membrane component, flavocytochrome b 558 (a heterodimer of gp91phox and p22phox), that acts as the catalytic core of the complex and is the electron transferase, and p40phox, p47phox, p67phox, Rac2, and Rap1A, that act as cofactors for oxidase activity [70, 192, 154]. In unstimulated neutrophils, these components are segregated into membrane (flavocytochrome b 558 and Rap1A) and cytosolic (p40phox, p47phox, p67phox) compartments. Upon activation, cytosolic components translocate rapidly to plasma and/or phagosomal membranes [193, 194, 195, 196]. The NADPH oxidase transfers electrons from cytosolic NADPH to molecular oxygen outside of the cell or within the phagosomal compartment, thereby producing superoxide. Although superoxide is thought to have limited direct microbicidal capacity, the molecule is used to generate secondarily derived ROS such as hypochlorous acid, hydroxyl radical, chloramines, and singlet oxygen, all effective microbicides [197, 198, 199, 200]. The ability of neutrophils to produce large amounts of superoxide relies on continued function of the NADPH oxidase, a process that requires rapid charge compensation and pH regulation in the phagosomal compartment [201, 202]. Oxidase assembly and activity is modulated by post-translational modifications of subunits (phosphorylation of p47phox) , interaction of subunits with lipid signaling molecules (interaction of p40phox with phosphoinositides) [204, 205, 206], and protein–protein interactions (e.g., SH3 domains present in p47phox, p67phox, p22phox) [207, 208]. The production of ROS derived from the NADPH oxidase is critical to host defense against invading microorganisms, as exemplified by chronic granulomatous disease (CGD), a hereditary disease characterized by defects in NADPH oxidase . Patients with such defects suffer from recurrent bacterial and fungal infections, including infections caused by S. aureus . The intricacy of concerted microbicidal efforts made by the neutrophil is evident by the augmentation of the oxygen-dependent microbicidal activity by MPO, an abundant hemeprotein stored within azurophilic granules . In the phagosome, MPO catalyzes a reaction with chloride and hydrogen peroxide to produce hypochlorous acid, a potent oxidizing agent and microbicide, as well as secondary products such as chloramines, hydroxyl radical, and singlet oxygen . The overall microbicidal contribution of the MPO–halide system has been debated, as patients with hereditary MPO-deficiency generally lack any increased susceptibility to infection, suggesting that ROS generated by NADPH oxidase and microbicidal activity of granule proteins may be sufficient to compensate for a lack of the MPO–halide system under certain conditions [200, 210]. A redundancy in function of the NADPH oxidase and the MPO–halide system was proposed by Rosen and Klebanoff . On the other hand, neutrophil cytoplasts, which retain a respiratory burst but lack MPO, are unable to kill ingested S. aureus unless they are coated with MPO . Furthermore, pharmacologic inhibition of MPO leads to a decreased ability of neutrophils to kill bacteria . Neutrophils from MPO-deficient patients do retain microbicidal activity against several bacterial pathogens, although at a lower level compared to neutrophils from normal donors, implying a sub-maximal response . Together, augmentation of the NADPH oxidase by MPO facilitates a most efficient response against invading microorganisms, while any redundancy in function further demonstrates the importance of the innate immune response. Often overlooked in the past, oxygen-independent killing mechanisms make a major contribution to the unique microbicidal capacity of neutrophils. Evidence of the importance of these mechanisms lies in the ability of neutrophils to kill certain organisms under anaerobic (oxygen limiting) conditions, wherein oxygen-dependent generation of ROS does not occur . Oxygen-independent microbicidal agents include neutrophil antimicrobial peptides (AMPs) and antimicrobial proteins such as α-defensins, cathelicidins, azurocidin, cathepsins, lactoferrin, lysozyme, proteinase-3, and elastase [70, 215]. These agents are delivered by the regulated mobilization and targeted fusion of cytoplasmic granules with either plasma membrane (exocytosis) and/or phagosomal membranes (degranulation) . Regulation of mobilization and targeting is incompletely defined, but in part involves (a) regulation of actin/cytoskeletal rearrangement, (b) calcium- and/or ceramide-mediated signal transduction, and (c) soluble N-ehtylmaleimide sensitive factor attaching proteins (SNAPs) and SNAP receptors (t-SNAREs) [70, 154]. Azurophilic (primary) and specific (secondary) granules are differentially targeted, owing to differences in cargo carried by each class of granule [70, 215]. Azurophilic granules containing a variety of pore-forming peptides (α-defensins), proteases (proteinase-3, elastase), and other cytotoxic molecules (azurocidin, lysozyme, MPO), are targeted primarily to the phagosome, exposing ingested microbes to high concentrations of antimicrobial agents . Specific (secondary) granules containing integral membrane components of the NADPH oxidase (flavocytochrome b 558 ) as well as some pore-forming peptides (cathelicidins) and cytotoxic molecules (lysozyme) are targeted to both the plasma membrane and the phagosome, serving the additional function of enriching the plasma membrane with critical components of the NADPH oxidase and surface molecules/receptors important for neutrophil response (integrins, chemotactic and opsonic receptors) [70, 215]. Specific granules also contain lactoferrin, an iron-binding protein which utilizes an additional, unique strategy against ingested microbes. Lactoferrin sequesters iron needed for microbial growth and also modulates Fenton-derived production of hydroxyl radical [217, 218]. A similar strategy has been described for neutrophil calprotectin (S100A8/A9), which inhibits growth of S. aureus by sequestering nutrient Mn2+ and Zn2+ within abscesses . The majority of microbicidal activity takes place within mature phagosomes. However secreted, extracellular molecules, namely the group IIA phospholipase A2 (gIIA-PLA2), have been shown to act synergistically with neutrophil NADPH oxidase to promote digestion of S. aureus phospholipids, demonstrating collaboration between oxygen-dependent and oxygen-independent killing mechanisms . In addition to ROS production and degranulation, a third neutrophil microbicidal mechanism has recently been proposed. Novel structures known as neutrophil extracellular traps (NETs), which contain decondensed chromatin, bound histones, azurophilic granule proteins, and cytosolic proteins, have a demonstrated capacity to bind to and kill a variety of pathogens including S. aureus . Extrusion of such structures by neutrophils is predicted to limit microbial spread and dissemination, while enhancing effective concentrations of extruded microbicidal agents, thereby promoting synergistic killing of attached microorganisms . It is debated whether extrusion of such structures is to be classified as a novel form of cell death or if these structures are extruded from live, intact cells. The phenomenon of NETosis has also been observed in other granulocyte cell types including mast cells and eosinophils [222, 223]. The molecular basis of NET formation is yet poorly understood, although the process is directly linked to ROS production, as neutrophils from CGD patients, lacking functional NADPH oxidase, are unable to form NETs . In vivo demonstrations of such structures have been provided by a limited number of human infectious and non-infectious diseases, as well as several animal infection models [222, 223]. It is not clear whether NETs alter the normal course of the inflammatory response or perhaps exacerbate inflammation. It has even been proposed that formation of NETs may contribute to autoimmune disorders . The role of NETs in the innate immune response and our understanding of the mechanisms underlying this process remain incompletely defined and will require further research. Turnover of immune cells is essential for maintenance and homeostasis of both innate and acquired immune systems, ensuring that cells working “out in the field” have sufficient functional capacity. Turnover is accomplished universally by the process of apoptosis or programmed cell death, which facilitates efficient, non-phlogistic removal of senescent or effete cells of all types [225, 226]. This process becomes increasingly critical for cells that carry high cytotoxic capacity and pro-inflammatory potential, such as neutrophils. Additionally, neutrophils are the most numerous leukocytes in humans, have a rapid rate of turnover, and critically function as first responders, further underscoring the importance of regulated, efficient removal of such cells in a manner that serves to prevent unnecessary host tissue damage and inflammation. Following apoptosis, which maintains neutrophil membrane integrity and prevents release of cytotoxic neutrophil contents, apoptotic neutrophils are recognized and ingested by macrophages without pro-inflammatory consequence, completing the turnover cycle. In the absence of stimulation, senescent neutrophils undergo spontaneous or constitutive apoptosis, a process initiated by signaling from within the cell, resulting in caspase activation and eventual removal by macrophages . This intrinsic ability to undergo apoptosis is essential for maintaining appropriate cell numbers in circulation . In the context of infection, where neutrophils are recruited to sites of infection, phagocytosis and subsequent neutrophil activation significantly accelerates apoptosis, a process known as phagocytosis-induced cell death (PICD) now thought to play a central role in resolution of the inflammatory response [106, 229, 230] (Fig. 2). At the onset of infection, an influx of neutrophils to respective sites within tissues is driven by detection of a series of host- and/or bacterial-derived immunomodulatory factors that influence chemotactic movement and prime neutrophils for enhanced function. Many of these early pro-inflammatory signals have the additional ability to delay spontaneous neutrophil apoptosis, implying that increased survival of neutrophils is desirable early in the inflammatory process, perhaps promoting efficient pathogen recognition and removal [226, 231]. Additionally, phagocytic uptake of invading microorganisms induces a neutrophil-mediated acute pro-inflammatory response, as evidenced in part by increased levels of transcripts involved in the acute inflammatory response . More recently, it has become clear that phagocytosis of numerous pathogens, including S. aureus, significantly accelerates neutrophil apoptosis/PICD [232, 233]. Apoptosis ultimately leads to an overall decrease in cellular functions including a decreased ability to produce ROS, phagocytose, secrete cytokines, adhere, and chemotax [190, 234]. Concomitant to rapid induction of apoptosis is an accompanied downregulation of neutrophil pro-inflammatory capacity, illustrating the fine balance of signals required for effectively dealing with invaders and resolving acute inflammation [102, 190]. As apoptosis progresses, neutrophils undergo important cell surface changes including transposition of phosphatidylserine, oxidized lipids, and carbohydrate moieties to the external surface, marking apoptotic neutrophils for recognition by surface receptors on macrophages . Recognition by macrophages leads subsequently to ingestion (efferocytosis) and non-phlogistic removal of apoptotic cells, as well as release of anti-inflammatory molecules, such as TGF-β and IL-10 [103, 236, 237, 238] (Fig. 2). The importance of this removal process is highlighted by the redundancy of recognition receptors described for macrophages . Mice lacking the macrophage receptor for phosphatidylserine accumulate apoptotic cells in the lung and brain, and develop autoimmune disorders [239, 240]. Thus, it is clear that neutrophil apoptosis plays a central role in desired resolution of the acute inflammatory response. Many pathogens, including S. aureus, have a long history of interaction with the human innate immune system. Therefore, it is not surprising that many pathogens have evolved mechanisms to evade and combat this important front line of host defense. S. aureus has evolved an abundant repertoire of factors aimed at evasion of the innate system, including host defense strategies utilized by neutrophils. There exists significant redundancy in the numerous mechanisms employed by S. aureus against the innate immune system, reflecting the importance of such defenses and their role in the outcome of infection. S. aureus factors characterized to date include those that prevent recognition and binding of the pathogen by neutrophils, as well as those that provide protection against intracellular/phagosomal microbicides . In addition to passive defense mechanisms, S. aureus secretes several cytotoxic molecules that have the ability to damage immune cells . S. aureus attempts to minimize or inhibit recognition by the host by hiding and/or modifying the bacterial surface. This is afforded by production of exopolymers such as capsular polysaccharide forming the bacterial capsule and/or polysaccharide intercellular adhesion, a unique extracellular matrix biofilm component that serves to modify the typical negative charge of the bacterial outer surface [241, 242, 243, 244]. Additionally, the well-known protein A, which binds the Fc region of IgG, lends the ability to coat the bacterial surface with non-specific antibodies (in the wrong orientation), providing immunologic disguise and potentially disrupting opsonization and phagocytic uptake [245, 246]. Chemotaxis inhibitory protein of S. aureus and staphylococcal complement inhibitor block receptor mediated recognition of N-formyl peptides produced by bacteria and complement-mediated uptake, respectively [247, 248]. Curiously, despite the numerous mechanisms employed by S. aureus to inhibit binding and phagocytosis by neutrophils, these phagocytes rapidly take up the pathogen. Protection against host oxygen-dependent microbicidal killing mechanisms is in part provided by catalase and superoxide dismutase, which eliminate harmful ROS produced within the phagosome following ingestion . Staphyloxanthin is a golden pigment produced by S. aureus and has also been shown to play a protective role against ROS . Mechanisms also exist for bacterial defense against oxygen-independent killing mechanisms, including those mediated by AMPs. In addition to releasing non-specific proteases , S. aureus senses the presence of AMPs via a three-component gene-regulatory system, which regulates downstream bacterial responses including the d-alanylation of teichoic acids and incorporation of lysyl-phosphatidyl glycerol in the plasma membrane, thereby decreasing overall negative charge of the bacterial surface [251, 252, 253, 254]. These surface modifications reduce the efficiency of the binding of cationic AMPs to the bacterial surface. Furthermore, the VraFG transporter is responsible for the removal of AMPs from the cytoplasm or plasma membrane [251, 252]. In addition to these rather passive defense mechanisms, S. aureus produces a number of toxins that directly attack white and red blood cells. Such toxins include a family of leukocidins, α-toxin (α-hemolysin), and the recently described PSMs. These molecules have the ability to form pores in target cell membranes [152, 255]. Lastly, several types of secreted S. aureus toxins are also classified as superantigens, taking the strategy of overstimulating the immune response to potentiate undesired responses and cause disease [256, 257]. Examples of superantigenic toxins include TSST and staphylococcal enterotoxins . It is evident that apoptosis plays a major role in the resolution of the acute inflammatory response, likely having an impact on the outcome of disease. That being said, some pathogens have also devised means to modulate normal turnover and apoptosis of neutrophils, leading to alterations in the desired resolution of infection  (Fig. 2). Although the short life-span of neutrophils is not conducive to the long-term survival strategies employed by many intracellular pathogens, Anaplasma phagocytophilum, the causative agent of human granulocytic anaplasmosis, has the ability to delay neutrophil apoptosis, supporting replication and survival of the pathogen within an endosomal compartment [189, 226, 258]. On the other hand, S. aureus, especially CA-MRSA strains, have the remarkable ability to induce rapid lysis of neutrophils and/or accelerate PICD to the point of secondary lysis, potentiating undesired release of neutrophil contents and pathogen survival [71, 72, 102, 226]. In either case, modulation of the normal turnover process results in pathogen survival, promotion of pathogenesis, and likely dissemination and disease (Fig. 2). The increased virulence of CA-MRSA strains was initially inferred from (a) the ability of these strains to cause disease in otherwise healthy individuals, (b) the ability of these strains to cause unusually severe disease, and (c) their ability to spread rapidly among groups of individuals. Corroborating the epidemiologic data, experimental data have demonstrated conclusively that CA-MRSA strains are more virulent than representative HA-MRSA strains in animal models of infection [71, 72]. Increased virulence is attributed largely to an enhanced capacity of CA-MRSA strains to resist killing by neutrophils, compared to HA-MRSA strains . Survival of CA-MRSA strains in in vitro assays with human neutrophils leads to rapid lysis of these host cells, and release and ultimate growth of bacteria [72, 259]. This follows with the idea that increased virulence lies, at least in part, in the enhanced ability to alter normal neutrophil function and turnover. Early distinction of CA-MRSA strains from traditional HA-MRSA strains, which included differences in PFGE typing and antibiotic resistance profiles, suggested that CA-MRSA strains were not merely hospital strains that had escaped into the community. Therefore, efforts to understand the molecular basis of the enhanced virulence of CA-MRSA strains have since focused on identifying additional genotypic and phenotypic differences between CA-MRSA and traditional HA-MRSA strains. Although significant progress has been made in understanding components that contribute to the success of CA-MRSA, a complete understanding is complicated by the multi-factorial approach to virulence that is intrinsic to S. aureus. That is, no single virulence factor contributes exclusively, making it difficult to determine contributions made by individual components that have overlapping or redundant functions. Despite this obstacle, several S. aureus virulence determinants are implicated in the success of CA-MRSA. Alpha (α)-toxin (also known as Hla or α-hemolysin) is a widely studied pore-forming toxin capable of destroying a variety of host cells, including epithelial cells, erythrocytes, fibroblasts, monocytes, macrophages, and lymphocytes (but not neutrophils), and has long been considered a major virulence determinant of S. aureus [260, 261]. Although it is ubiquitous among clinical isolates, recent studies have clearly demonstrated a primary role for α-toxin in experimental CA-MRSA infections. CA-MRSA strains lacking α-toxin were avirulent in a murine pneumonia model of infection compared with isogenic wild-type strains, and active and passive immunization against α-toxin provided animals protection from death in the same model [262, 263]. Mechanistically, α-toxin elicits a host chemokine response in the murine pneumonia model, promoting an influx of neutrophils thought to be largely responsible for lung injury during infection . Importantly, the amount of α-toxin produced by CA-MRSA in vitro correlates with the severity of lung disease observed in such animal models [262, 265, 266]. The role of α-toxin has also been demonstrated in murine and rabbit models of CA-MRSA skin infection, providing further evidence that α-toxin plays a major role in CA-MRSA disease [267, 268]. α-Type phenol-soluble modulins (α-PSMs) are a subset of recently reported PSMs . These molecules are surfactant-like, amphipathic, α-helical peptides (∼20–25 aa in length) with limited homology to PSMs produced in other staphylococcal species including Staphylococcus epidermidis . The α-PSMs are ubiquitous to all sequenced S. aureus strains, have the ability to induce neutrophil chemotaxis and cytokine release through a specific receptor-mediated process, and also have the ability to lyse neutrophils, erythrocytes, and monocytes via a receptor-independent process . Isogenic mutant CA-MRSA strains that lack α-PSMs have significantly reduced virulence in murine bacteremia and skin infection models compared to wild-type parental strains, indicating they are major determinants of CA-MRSA virulence . Notably, in vitro production of α-PSMs by CA-MRSA strains is significantly higher than that of prominent HA-MRSA strains. Additionally, overexpression of α-PSMs in a representative HA-MRSA strain increases cytotoxic capacity of culture supernatants to a level comparable to that observed with CA-MRSA culture supernatants, indicating that the difference in cytolytic capacity between CA-MRSA and HA-MRSA strains is largely due to differential production of α-PSMs . However, the contribution of α-PSMs to neutrophil lysis following phagocytosis remains to be determined. Production of α-PSMs is regulated in part by the accessory gene regulator (agr), a well-known, global regulatory/quorum sensing system. α-Toxin and α-PSMs are both encoded in the core genome, as opposed to mobile genetic elements (MGEs), which encode many other S. aureus virulence molecules. Recent analysis of gene expression within subclones of S. aureus clonal complex 8 (defined by MLST), including USA300 and other closely related strains, revealed that USA300 has increased expression of core-genome encoded virulence factors such as α-toxin and α-PSMs, lending to the novel idea that enhanced virulence is based largely on differential expression of core-genome elements rather than strictly acquisition of MGEs . Differential expression of core-genome determinants is likely due to poorly understood rearrangements of gene regulatory networks in these strains. It is likely that the extraordinary success of CA-MRSA also involves unique genetic factors that facilitate colonization and transmissibility. Although such factors may not contribute directly to virulence, they may be important for the overall burden of disease, as seen with the rapid dissemination of CA-MRSA among groups of individuals. One such factor is the type-I arginine catabolic mobile element (ACME), an MGE unique to USA300, identified by whole genome sequencing . This 31-kb MGE is physically linked to the SCCmec type IV element and may have been acquired from S. epidermidis [67, 270]. ACME encodes two gene clusters, one encoding a complete arginine deiminase (arc) pathway, and the other an oligopeptide permease operon. Arginine deiminase activity produces ammonia and ATP and might facilitate colonization by neutralizing the acidic environment found on skin as well as producing an additional source of ATP . In addition, depletion of the arginine pool may serve to prevent efficient production of nitric oxide, a key immune molecule . Oligopeptide permeases are usually involved in peptide uptake as a nutrient source, although they are also implicated in other functions such as quorum sensing, chemotaxis, cell adhesion, and resistance to AMPs . Experimental models of infection have demonstrated either no impact or a limited impact of ACME on virulence [67, 272]. Although a function related to enhanced colonization and/or persistence on human skin, leading to increased transmissibility, has been inferred from the putative functions of genes found within ACME, the physiologic function of these gene clusters in the context of CA-MRSA pathogenesis remains to be determined. This will require experimental colonization models to directly assess any role ACME may play in the colonization, persistence, and/or transmissibility of CA-MRSA. Panton–Valentine leukocidin (PVL) is a bi-component cytolytic toxin encoded on a prophage acquired by horizontal gene transfer . PVL has the ability to prime neutrophils, induce proinflammatory responses such as cytokine release, and has long been known, at higher concentrations, to lyse leukocytes by forming pores in target-cell membranes [42, 274, 275, 276, 277, 278, 279]. PVL genes are present in many strains that cause CA-MRSA infections, and the toxin is associated with S. aureus strains that cause certain types of severe skin infections (e.g., furuncles and carbuncles) and necrotizing pneumonia [42, 280, 281, 282]. It is noteworthy that PVL was also present in the pandemic phage-type 80/81 clone, which caused severe infections in hospitals and the community in the 1950s and 1960s . Therefore, elucidating the role for PVL (if any) in the success of CA-MRSA has been of great interest and remains a hotly debated topic in light of many experimental studies, some of which are conflicting. Numerous animal models of infection have been utilized to investigate PVL’s contribution during CA-MRSA infections including murine, rat, rabbit, and non-human primate models of skin infection, bacteremia, and pneumonia [11, 12, 13, 17]. Generally, findings from studies to date indicate that PVL makes little or no unique contribution to the virulence of CA-MRSA, but may contribute in specific contexts resulting in severe diseases or syndromes [12, 71, 284, 285, 286, 287, 288]. Due to that fact that PVL production is sensitive to environmental conditions (e.g., growth media) and is strain dependent, as well as the fact that the susceptibility of white blood cells to PVL differs among mammalian species, it is not surprising that conflicting findings have been reported [289, 290]. Recently Kobayashi et al. investigated the role of PVL in a novel rabbit subcutaneous skin infection model, reporting that a USA300 wild-type and isogenic lukS/F-PV deletion strains produced similar abscesses, whereas deletion of genes encoding other well-established virulence determinants—α-toxin, α-PSMs, and Agr—decreased abscess formation . Concurrently, a rabbit intradermal skin infection model was published using similar strains, but these authors reported a role for PVL in pathogenesis of S. aureus skin infection . These seemingly contradictory findings highlight the possibility that PVL functions in specific experimental contexts, and emphasizes the need for careful interpretation and comparison among experimental models used. Taken together, evidence to date indicates that PVL is not a major virulence determinant of CA-MRSA, but is simply one of many S. aureus secreted molecules that can contribute to infection. A recent surface proteome study of USA300 identified an abundant, novel two-component leukotoxin, LukGH, related to other two-component toxins of S. aureus such as PVL . LukGH is localized to the cell surface and is secreted into culture medium. Importantly, LukGH has potent cytolytic activity toward neutrophils, acts synergistically with PVL to cause neutrophil lysis in vitro, and is highly expressed during phagocytosis. These results suggest LukGH contributes to USA300 virulence . Further investigation is required to demonstrate a physiologic role for LukGH in the ability to cause disease. Acquired and congenital defects of the immune system are associated with an increased susceptibility to infectious disease. Description of numerous primary immunodeficiency diseases (PIDs), defined here as a genetically determined disorder resulting in an enhanced susceptibility to infectious disease, has served to bolster the importance of many human immune functions, including the role of neutrophils in defense against bacterial pathogens such as S. aureus [209, 293, 294, 295]. PIDs are broadly classified based on their underlying molecular defect and include deficiencies in humoral immunity (B lymphocytes, antibodies), cell-mediated immunity (T cell-mediated), combined humoral and cell-mediated immunity, and non-specific host defense (phagocytes, natural killer cells, complement pathway). PIDs characteristically present in childhood with persistent, recurrent, and difficult to treat infections. Importantly, pathogen susceptibility patterns, sites of infection, and complications of infection are known to vary according to immune deficit, and are major considerations made during diagnosis [293, 295]. Each class of primary immunodeficiency has a characteristic set of infectious predispositions that are often employed to guide initial diagnostic testing . Defects in T cell function are generally associated with infections caused by viruses and Candida species, whereas patients with primary phagocyte defects yield an increased susceptibility to specific bacterial and fungal infections . In some cases, pathogen susceptibility points to the specific disorder; susceptibility to intracellular pathogens such as mycobacteria, Salmonella, and Listeria is suggestive of a defect in the interferon-γ−interleukin-12 signaling axis , while infections caused by S. aureus and Aspergillus species predominate among patients with CGD . Several PIDs have been described for a range of underlying primary neutrophil defects, including functional defects in neutrophil adhesion, chemotaxis, phagocytosis, vesicle trafficking, NADPH oxidase assembly/function, MPO deficiency, glucose/glycogen metabolism, signal transduction, and granular defects . Many of these defects are closely associated with increased susceptibility to S. aureus infections, and often result in life-threatening and/or fatal complications. Severe congenital neutropenia (SCN) is associated with mutations from two different genes; mutation in HAX1, a mitochondrial protein thought to have an anti-apoptotic role, is associated with an autosomal dominant form of SCN, while mutation of ELA2, the gene encoding elastase 2, is associated with an autosomal recessive SCD resulting from endoplasmic reticulum (ER) stress, unfolded protein response (UPR), and apoptosis . Infectious complications arising in SCN patients include cellulitis, perirectal abscesses, peritonitis, stomatitis, and meningitis commonly resulting from infections caused by S. aureus and Pseudomonas aeruginosa [209, 296]. Leukocyte adhesion deficiency types 1 and 2 (LAD1 and 2) are caused by defects in adhesion molecules such as CD18 (β2 integrin; LAD1) or an inability to fucosylate glycoproteins acting as ligands for E-selectins (LAD2), respectively [209, 293, 295]. As a result of their inability to make initial attachment, or adhere tightly to endothelial cells, neutrophils are unable to egress from the vasculature to sites of infection [209, 293]. Clinical manifestations include delayed separation of the umbilical cord, poor wound healing, recurrent skin and soft-tissue infections, genital mucosa infections, intestinal and respiratory tract infections, and severe periodontitis. Infecting pathogens include S. aureus, Gram-negative enteric bacteria, Candida species, and Aspergillus species . Chédiak–Higashi syndrome is a disorder caused by mutations that affect the lysosomal transport protein LYST, and thus prevents normal phagolysosome formation and granule fusion [209, 293, 295]. This syndrome is partly characterized by recurrent, severe S. aureus infections. Other neutrophil disorders associated with S. aureus infections include neutrophil-specific granule deficiency and hyper-IgE syndrome (Job’s syndrome) [209, 293]. Importantly, some of these neutrophil disorders may involve defects in regulation of neutrophil apoptosis and/or turnover. Taken together, neutrophil function plays a major role in clearance of invading bacterial pathogens such as S. aureus . S. aureus remains a major cause of human infections, and the rise of highly virulent, drug-resistant strains has made treatment increasingly difficult. As a result, the overall burden of disease has increased within both the hospital and community settings, emphasizing the need for alternative therapeutic approaches. Although progress has been made toward understanding mechanisms used by S. aureus to evade innate host defenses, especially those involving neutrophils, our knowledge in this area is incomplete. The ability of S. aureus to evade primary host defenses plays a major role in the outcome of infection, as evidenced by the enhanced ability of CA-MRSA to evade and combat innate immunity and ultimately destroy neutrophils. This process likely contributes to the enhanced virulence of prominent CA-MRSA strains and their capacity to cause severe disease in otherwise healthy individuals. Therefore, a comprehensive understanding of the interface between innate host defense and S. aureus is needed to identify alternative therapeutic approaches. Underlying host genetic factors are likely important determinants of susceptibility to severe disease and must also be considered for development of alternative treatments. Renewed efforts—fueled by the rise of antibiotic-resistant strains—to develop vaccines that promote opsonophagocytosis of S. aureus have not been successful. The problem is twofold. First, S. aureus opsonized in normal human serum is readily phagocytosed by human neutrophils and there is no need to improve efficiency of uptake, which is the primary purpose of opsonophagocytic vaccines. Second, S. aureus, especially CA-MRSA, causes lysis of neutrophils following phagocytosis [297, 298]. This is a significant problem because, as stated above, neutrophils are the most prominent cellular defense against S. aureus infections. Ideally, a therapeutic maneuver would enhance the killing capacity of neutrophils after uptake of the pathogen or render S. aureus incapable of defending itself against microbicides produced by neutrophils. Novel approaches to target virulence as a means of attenuating disease are underway and include strategies such as passive immunization with antibodies against main virulence determinants of S. aureus . Some potential targets have been provided by identification of virulence determinants of CA-MRSA, including α-toxin and α-PSMs. For example, passive immunization with anti-α-toxin antibodies provides protection against lethal pneumonia in a murine model of infection, demonstrating the potential utility of such therapy as an adjunct to antibiotic administration . However, much functional redundancy exists among the numerous S. aureus virulence determinants, requiring a combinatorial therapeutic approach that includes targeting the most important virulence determinants. Therefore, elucidation of the contribution of host factors, as well as the major bacterial virulence determinants, to the development of severe disease is of major interest to future research. The authors are supported by the Intramural Research Program of the National Institute of Allergy and Infectious Diseases, National Institutes of Health.